July 9, 2017. A new beekeeper flew in from the Philippines this week. Please offer a warm welcome to our new apiary assistant, Peter John Rafosala. Rafosala is a 2014 graduate of Queen of Apostles Seminary, Tagum City, Philippines. He comes to Sweet Mountain Farm after gaining three years’ beekeeping experience at Honey House: Bees & Beeks Apiary. In the Philippines he raises stingless bees as well as local species of apis melifera. Rafosala will raise Russian queens at Sweet Mountain Farm. Working with Russian bees is a rare opportunity for Rafosala. Russian stock is not available in the Philippines and in the United States the species is limited. He will also inspect colonies, repair equipment, extract and bottle honey, maintain the grounds, staff farm markets, and deliver products. Rafosala began his search for a U.S. commercial apiary nearly a year ago. Wanting to gain new apiary management skills and diversify his knowledge on different species, he thought Sweet Mountain Farm was a good match. 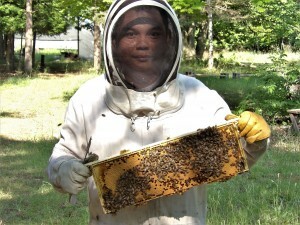 He will share his knowledge about Russian honeybees with other Filipino beekeepers. He is learning about unconventional apiary practices such as integrated and chemical free pest management. Rafosala’s primary role is queen rearing. One method for queen rearing is grafting, a surgical transplant of honeybee eggs. The process requires environmental controls, good eye sight, and good fortune. He establishes an optimal grafting environment, controlling room temperature and humidity. Larvae must be kept warm and moist. A grafting room’s temperature is 900 degrees Fahrenheit with 60% humidity. Grafting requires good vision. Often a jeweler’s magnifying glass is used. The egg is a mere 1.12 – 1.85 mm tall, 80% smaller than a grain of rice. A Russian queen lays 2,000-2,500 eggs per day compared to 1,000-1,500 eggs laid by other bee species. Royal jelly is secreted from the glands in the heads of worker bees and deposited in the bottom of each cell. Royal jelly is extracted to prime the artificial cell cup before the egg is transplanted. Rafosala removes 1-3 day old eggs from a frame containing as many as 3,600 eggs. A desirable egg is selected, removed with a grafting tool, and placed into an artifical plastic cell cup. Placement is critical since eggs must be transferred from a wax cell to cell cup in the exact position the egg was originally laid or the honeybees will not raise a queen from the grafted egg. Once the eggs are grafted, the new cell cups are placed back into a colony until the cells are capped and incubated by the workers. 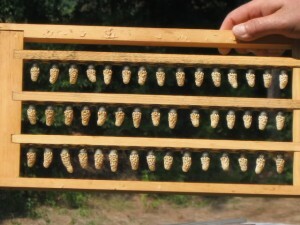 Grafting enables an apiary to produce 10-20 queens at one time, per colony. The grafts success rate depends as much upon technical skill as environmental cooperation. There are perils at each step in the process. It takes 16 days for a queen to emerge from its cell. Within a few days she flies to a drone congregation area where she is mated with as many as a dozen drones (male honeybees). The weather needs to be above 600 F. with calm winds. A rainy forecast can easily kill a queen or delay mating. Many times the newly mated queen will become the meal for a nearby bird. If the queen does not make it back to the hive, the colony can easily die out since there are no more 3 day old eggs from which a queen can be made. Intervention is needed to introduce additional eggs and start the process again. If anyone is interested in meeting Peter John Rafosala, he will be on Washington Island through October 1, 2017. He will staff Sweet Mountain Farm’s table at the Washington Island Farmer’s Market located at Gathering Ground, corner of Lakeview and Airport Roads. Wednesday, (4:00 p.m. – 6:00 p.m.) and Saturday, (8:00 a.m. – noon).